Please scroll through or click on the links below to read through the topics provided. 5. Afraid to Have Your Spouse Served? 7. When Can I File for a Divorce? 8. What is the Date of separation? 9. Do I Need Proof of Separation? personal experience typing documents under the direction of our clients. We warrant that as far as we know the information is accurate, but do not guarantee the same. All information provided is general in nature and does NOT constitute legal advice. Nor can we guarantee that any information we give to you will apply to your exact situation. Nor can any information provided be relied upon in any way to give you a specific result. Should you wish to seek legal advice specific to your situation or any matter, please consult with a lawyer. Do you hope to reconcile? Check out the video at the end of this page. 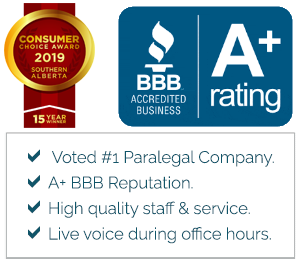 We cannot assist you by filing a divorce in Alberta unless you or your spouse has been ordinarily resident in the Province of Alberta for at least one year prior to commencing your divorce. If you require some sort of remedy prior to meeting the one-year residency, please contact our office to explore some of your options. Are you unable to locate your spouse so that he or she may be personally served? Does your spouse refuse to be personally served? Or is it impractical to arrange personal service on your spouse? If so, you must obtain an Order granting permission to serve your spouse substitutionally. advertising in the City the Defendant last lived. Afraid to Have Your Spouse Served? You might be able to convince the Courts that service should be dispensed with as a result of past violence towards you by your spouse. Obtaining an Order Dispensing with Service means you can proceed with a Request for Divorce without notice to the Defendant. You will have to provide details to support your case, sometimes supported with documentary evidence. You will also need to appear before a Judge to present your application—or you may seek the assistance of a lawyer or free Duty Counsel to appear before the Judge for you. We can assist you with an Order Dispensing with Service. You can file a Statement of Claim for Divorce as soon as you are separated. However, if you wish to obtain a Divorce under the grounds of “one year separation” , the final Request for Divorce cannot be filed until after the one year separation date has been met . You do not have to wait until the one year separation is up to submit your final Request for Divorce if you file under the grounds of cruelty or adultery. Though we cannot advise as to what is or should be your date of separation, it is our experience that two parties can file for a Divorce even if they live in the same house but are not living together as husband and wife—a common occurrence due to the economy when neither party can afford to live on their own or where parties choose to live in the same house for the sake of the children. Many of our clients have declared the same address as their spouse in the divorce papers. Early in my career as a paralegal, the courts rejected the divorce and asked why the parties shared the same address and comments such as “we do not share the same bedroom as husband and wife but continue live together for financial reasons (or for the sake of the children)” has always been satisfactory to the courts. There is a clause in the Statement of Claim for Divorce that asks if there were attempts at reconciliation. We have frequently stated, in the event the Plaintiff and Defendant have reconciled for a short period of time (or times) since separation: “Reconciliation for a total period of not more than 90 days since the date of separation proved unsuccessful.” This has been satisfactory to the Courts and the Courts have continued to allow the parties to use the original date of separation as long as total reconciliation did not amount to more than 90 days since that date. In my experience you don’t have to have a Legal Separation Agreement to be considered separated. The Plaintiff declares what he or she (truthfully) believes to be the date of separation in the Statement of Claim for Divorce and for so long as the date is not successfully challenged (usually by the Defendant), then the Courts accept this date in the Divorce application. In some cases, a Legal Separation Agreement or Sworn Affidavit attesting to separation is required for mortgage refinancing or to satisfy the Canada Revenue Agency with respect to child tax credits and GST credits. Please refer to the section on Separation Agreements for a list of some of the benefits of having a Legal Separation Agreement. Wait for a Divorce Judgment to be Granted and Certificate of Divorce Issued. When there are children involved, Federal Child Support Guideline worksheets must be prepared and approved by the Family Law Information Centre. Furthermore, both parties must attend the Free <<Parenting after Separation Seminar>>, unless exempt. The Plaintiff and/or Defendant require an emergency Divorce. Any matter that is or becomes contested. Affidavit of Service was not commissioned properly and a FIAT is preferable than attempting to get it fixed (for example the Affidavit of Service was signed in a foreign country and it would be problematic or risky returning it for correction). We’ve done this handout for lawyers, in the hopes that they might use this as a checklist and cut down on the number of files we have to reject. Even though we rarely reject one of your divorces, we thought you might be able to make use of this as well. As we are preparing the documents under your direction, you have an opportunity to review all documents before filing to ensure they are factually stated, especially with respect to the spelling of names and dates which you would be most familiar with. We do not normally charge extra for correcting mistakes on documents. In defence of lawyers they handle more complicated cases and as such, I believe it is only natural that they would have more mistakes. And, in some cases, legal advice can be far more valuable than any savings you may have as a result of hiring us instead of a lawyer. You need to use your judgment as to when it would be satisfactory to hire us and if in doubt, you can consult with a lawyer first or have us draft the first document (Statement of Claim for Divorce) then take it to a lawyer for review and advice. You can consult with a lawyer at any time. Upon receipt of their advice, you can then instruct us how to revise the documents on your behalf to take into account your new wishes based upon the advice you have received. If there are dependent children, you must advise us as to what you want for custody, access and child support. If you do not know what you want you can seek legal advice and/or attend the mandatory (and free) <<Parenting After Separation Seminar>>. During the seminar you will learn about custody, access and child support. You will learn about the rights and responsibilities of both parties and how to minimize the impact of separation on children. Though you are not advised as to what you should seek (they just provide general information), it is still educational and it may help clarify in your mind what you may wish to seek. The issue of child support is complicated. Normally, the Family Law Information Centre assists with child support calculations–which we facilitate on your behalf if you hire us to assist you with an Uncontested Divorce. The Plaintiff and Defendant are both required to provide proof of income when there are children. When one or both parties are unrepresented by lawyers, there is usually a greater ‘burden of proof’. We are typically required to provide proof of income for both parties, and failure to present the required information may result in a rejection by the Courts (but not always). If reasonable attempts to obtain disclosure have failed, the Courts may waive the requirement. Parties represented by lawyers do not usually have the same high ‘burden of proof’. I have been told the Courts are much more flexible and lenient when the parties are represented by lawyers and that proof of income does not always have to be presented to the Courts (though in the words of a Clerk “they really should provide financial information for both parties or at least their client”). I can only guess the Courts assume the lawyers have confirmed the income of both parties, reasonable attempts have been made or that there is good reason not to request or provide disclosure in that particular instance. As a result, it is my understanding they do not enforce disclosure on lawyers to the same extent as they do for unrepresented individuals. Please call to discuss your situation if you believe your spouse may refuse disclosure. Provincial Court (Family and Youth Division) – In the event you do not wish a Divorce at this time or you would like an immediate Order dealing with custody, access and child support, you may contact your local Provincial Court (Family Division). They provide free forms and assistant. You may wish to hire a lawyer in the event matters are or may become disputed and you do not want to jeopardize your claim. This Court, or a lawyer, can also inform of circumstances in which you may wish to proceed with a claim through the Court of Queen’s Bench without finalizing a Divorce. Processing times and procedures fluctuate depending on the level of cooperation from the spouses, how and where the Defendant was served, what city the divorce application was filed in, and grounds for Divorce. Average processing time is normally 4 to 6 months (if the Defendant is served personally in Alberta), 5 to 7 months (if the Defendant is served personally elsewhere) or 6 to 8 months (if the Defendant is served substitutionally or outside of Canada). 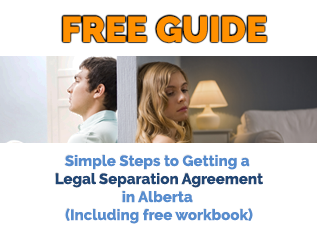 One to four months: Length of time it then takes most major centres in Alberta to grant a divorce once the final papers have been filed (processing times are usually slower during July to September and December to February as a result of staff holidays during the summer and at Christmas time). Divorces not involving children are typically faster than divorces involving children. Some of the Court Houses in small centers may be able to grant a divorce in less than one month. The Courts automatically mail a Divorce Judgment out to the Plaintiff and Defendant. In an emergency, it is possible to have a Divorce granted at this stage in less than 2 weeks. In an emergency situation, the divorce may be granted and become effective as early 4 to 6 weeks if the Defendant provides his or her consent and a Clearance Certificate has been issued). If the Defendant refuses to provide his or her consent, you might be able to get the divorce in less than 3 months. We always recommend clients do not set a new wedding date until a divorce has taken effect. A divorce takes effect 31 days after it is granted, unless appealed or the appeal period has been waived by both parties. For your free consultation, please call us. We’d be happy to discuss your situation and help you save hundreds and possibly thousands of dollars by using our services. Why pay more for routine legal services when you don’t have to? Clients in or near Calgary schedule an appointment when they are ready to proceed. We work by email/mail for clients who are unable to attend our office in person. We are delighted to help applicants all over Alberta, including applicants outside Alberta or Canada who’s spouse resides in Alberta. If you hope to reconcile…check out this video. 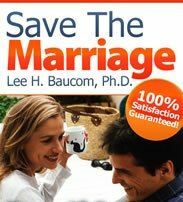 If you do purchase it, please note that I receive a small stipend…which is significantly lower than the cost of a divorce! I would not recommend this video if I did not think the materials were great. I would earn more if I helped you with a divorce, but would prefer that you reconcile. Click the photograph for the information.